The project was conducted in conjunction with Pond & Company, who supplied the architectural and engineering services as well as McLeroy Plumbing who installed the systems at the Army Reserve Center in Winder, GA. The new solar thermal heating systems will do their part to meet the Army’s goal of moving away from fossil fuels, while providing the most up to date training facility. The first solar thermal installation included 40 TitanPowerPlus SU2 series flat plate collectors and an 806 gallon non-pressurized solar storage tank for domestic hot water. A second system was installed for the OMS building, which included a HelioMaxx 50FP Pro Kit. Each system provided 50% solar fraction and 60% solar fraction, respectively. 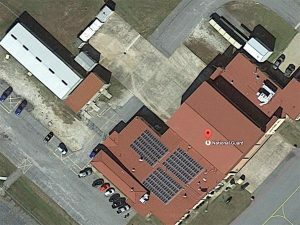 The Army Reserve Center is located in Winder, Georgia, which is in Barrow County, approximately 40 miles north east of Atlanta. The facility is approximately 52,000 square feet and home to almost 400 reservists.